Bellagio is a beautiful village located on the promontory where Lake Como separates into two branches. The Hotel Metropole is situated in the centre of the village and is privileged enough to be the only Hotel in Bellagio with a view directly onto Lake Como, indeed our Patio Restaurant contains breathtaking views of the Lake as does our Hotel Terrace. Getting to Lake Como Lake Como (Lago di Como) is a picture-perfect Italian Lake and one of Italy’s most scenic destinations. 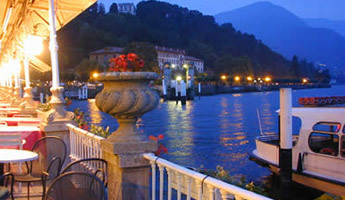 Located not far from Milan in the north of Italy Lake Como is popular with both foreign tourists and Italians alike. Lake Como is 50 km long, slender and extremely deep. The southern end forks into two long 'legs', with the picturesque town of Bellagio situated on the promontory between them. To read more about activities on Lake Como click here. Steamers, boats and buses all serve Bellagio with great connections towns and villages all over Lake Como. 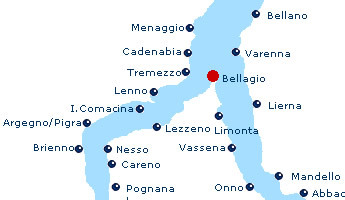 A frequent boat service (with car ferry) connects the Bellagio with the other main tourist destinations of Lenno, Tremezzo, Villa Carlotta, Cadenabbia, Menaggio, and Varenna. The frequency of the service increases in peak season i.e. from May to September but also operates in the Winter months. A less frequent but faster boat travels the full length of the lake from Como (with stops at most of the above). Buses run approximately hourly all the way up the west coast from Como round to Colico at the north-east. Bellagio does not have a train station. The nearest train station is Como Como's San Giovanni the main railway station. From here you can either take the bus or a boat to reach Bellagio. away. Como station is also often the first stop for tourists and travellers arriving by rail from Switzerland. Chiasso (km.34) - Como - Bellagio / Lugano (Km.29) - Gandria - Porlezza - Menaggio - Cadenabbia (Ferry boat to Bellagio) / St. Moritz (Km. 105) - Castasegna - Chiavenna - Colico - Bellano - Varenna (Ferry boat to Bellagio / Sempione (Km.175) Domodossola - Stresa - sesto Calende - Varese - Como - Bellagio. The nearest major Air Terminal for Como is Milano Malpensa International Airport. To arrive from Malpensa you should ideally hire a car or alternatively take the airport shuttle bus to Milan and then a train to Como. See also Freqntly Asked Questions. Nearby Attractions, Distances and How to get there from Hotel Metropole. The town is historic and charming, with promenades, stately hotels and gardens open to the public, including Villa Serbelloni. Bellagio Tourist Information Office is on Piazza dell Chiesa – to read more about Bellagio click here see Lake Como Acrivities for more information.